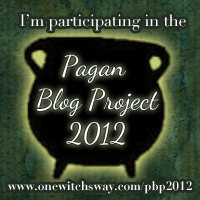 I discovered Wicca at the age of 11 so obviously I still lived at home with my parents. My family knew all about my chosen path and once I'd explained that it wasnt some crazy evil cult, they were ok about it! At that point I had no space or proper surface for an altar I had a childs bedroom, and although my practising of Wicca was no secret I was fiercly private and didnt leave the few candles, pentacles and crystals I owned out in the open. So I never really had a permanent altar until I moved out 2 years ago and into the house I share with my husband. But then I found that although we had a whole house, the altar seemed to not 'fit in' anywhere so again the altar was not permanent. However our chihuahua puppy began chewing and jumping onto the coffee table downstairs and we were so worried about her falling off, so we decided it would go upstairs and into the spare bedroom which is my 'work' room. We moved everything around in the 'work' room to accomodate the coffee table and left it there. I went in later that night to put a book away, not switching the light on. I glanced out of the window to be met with a glorious and beautiful full moon shining through the window directly onto the table. Then it came to me, This would be my altar. It was upstairs in a private quiet area away from all 'the madness' of the rest of the house, it is lovely and big to fit everything on, and above all it FELT right! Something I'd never felt when trying to find somewhere for the altar before. I finally had a permanant place to put the Goddess staue I had made from clay years earlier! (ok, so it kinda looks like a skittle, but I made it with love)so there it is, the story of how I finally found my altar! I will upload a picture of altar at some point but heres my goddess staue.